The church of San Pietro in Gessate is located just opposite the Palace of Justice and is a fine example of Lombard architecture of the fifteenth century. Unfortunately, it was severely damaged by bombings during the Second World War and almost all the frescoes in the chapels on the right side were irretrievably lost. Here a photo gallery showing the right aisle, lost almost entirely, and the effects of the bombing. On the other hand those of the chapels on the left are still visible (although some in poor condition) and fascinate for their great beauty. The present church construction began between 1458 and 1461, with the erection of the main chapel (= central apse), at the instigation of the Portinari brothers, owners of the Milan branch of the Medici Bank, who also financed the famous chapel in the Basilica of Sant'Eustorgio that take their name, one of the greatest Renaissance masterpieces in Milan. The design of the church is unanimously attributed to Guiniforte Solari, who in the same years directed the construction of the Ospedale Maggiore and of the Basilica of Santa Maria delle Grazie, to which it is possible to find many points of similarity. Over the centuries the church underwent various modifications and additions. One of the most important took place in 1571, when the apse, originally a simple rectangular chapel, was stretched until it assumed its present very deep shape. In the early twentieth century the facade was rebuilt. Following the project presented by the architect Diego Brioschi, the two side entrances were eliminated and the windows in Baroque style were completely redone, replaced with two single lancet windows and by one large rose window. Reinforcements were added and the walls that enclosed the outdoor spaces between the chapels were replaced with railings. The church acquired its present appearance only in 1912. In the image below, coming from the web site Milano nei cantieri dell'Arte you can see the facade of the church before and after the interventions of Brioschi. The Church of San Pietro in Gessate was once part of a monastery. The latter was abolished by Empress Maria Theresa in the 1770s and its assets passed to the male orphanage of the Martinitt, which had its headquarters there until 1932. One of the cloisters of the monastery was included in the nearby High School Leonardo da Vinci. Architecturally, the Church of San Pietro in Gessate has many elements in common with the Basilica of Santa Maria delle Grazie, another work by Guiniforte Solari. The plan is a Latin cross with projecting transept (ie it extends beyond the perimeter of the church on both sides) with halfoctagonal apses and division in three naves. The main nave is twice as wide as the aisles. At the same time the width of the interior is almost double compared to its height. The side chapels, five on each side plus the terminal chapels of the transept, are all of the same size (except those of the transept), and have halfoctagonal shape with umbrella vault. Their beautiful decoration was commissioned by several members of the ducal court of Milan in the fifteenth century who had decided to be buried in them. -Grifi Chapel: (Photo 8) It corresponds to the terminal part of the left arm of the transept and houses works by three important Lombard artists: the Butinone and Zenale for the frescoes, Benedetto Briosco for the memorial to Ambrogio Grifi. The cycle of frescoes was painted between 1490 and 1493 by the Butinone and the Zenale after that Ambrogio Grifi had unsuccessfully contacted Vincenzo Foppa from Brescia. It remained hidden for a long time under an eighteenth-century plaster and was rediscovered only in 1862. The frescoes, unfortunately partly very damaged, depict episodes from the life of St. Ambrose. The cycle must be read from the bottom right to top left. Note the representation of Saint Ambrose on horseback in the center lunette. It refers to the miraculous appearance of St. Ambrose during the Battle of Parabiago. On the floor, on the right, there is furthermore the tomb statue of Ambrogio Grifi. It was originally part of a larger and more complex monument. -Chapel of Saint Anthony Chapel or Obiano Chapel: (Photos 5 and 6) The date of completion of the chapel is uncertain. It ranges from 1474 to the last decade of the fifteenth century. The splendid frescoes in the chapel depict episodes from the life of the saint, as far as the walls, and the doctors of the church, with regard of the ceiling. Above the altar there is a beautiful altarpiece attributed to Montorfano. -Chapel of the Virgin: (Photo 2-4) On the left wall the Marriage of the Virgin and a glory of angels are depicted, on the right wall a Death of the Virgin and a Christ on throne between the angels and the saints Peter and Paul. Very interesting and original also the ceiling decoration. Of anyone of the frescoes is known with certainty the author, although there are different possible attributions. -Chapel of St. John the Baptist: (Photo 7) It contains scenes from the life of St. John the Baptist. Also in this case the author of the decorations is uncertain. -Chapel of St. Martin: Fifth chapel on the right. It remains only a fresco, rediscovered in 1924 and removed from the wall only after the bombing of 1945. Attributed to Montorfano (but not without doubts), the fresco depicts the miraculous appearance of St. Ambrose, "gone away shortly" while saying mass to go at the bedside of St. Martin of Tours. -Chapel of St. Mauro: It is the fourth chapel on the right and is the only chapel of that side of which a significant part of the frescoes is still intact (although in poor condition). The frescoes, attributed to Moncalvo with the help of Daniele Crespi, depict episodes from the life of the saint. Furthermore it is necessary to mention the great baroque altar in polychrome marble of the eighteenth century (Photo 9), the wooden crucifix of the seventeenth century in the right arm of the transept and the paintings of the presbytery, works of Carlo Sacco, Lanzani and Giovan Battista Drago. 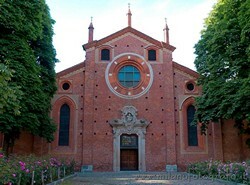 The Church of San Pietro in Gessate is, in our opinion, one of the most underrated cultural heritages of Milan. The frescoes that are visible in it present an unique stylistic variety and aesthetic elements that seem to disappear in the frescoes found in other famous and relatively little younger churches, like the Church of San Maurizio and the Chartreuse of Garegnano, to give way to greater uniformity dominated by those elements most likely able to ensure the observer's immediate emotional involvement. To be noticed, in particular, in the frescoes on the sides of the Chapel Of Virgin the extensive use of dark, yet also cold, colors such as purple, brown, bottle green, to give a colorful picture, but at the same time characterized by an almost dreamlike atmosphere. The frescoes in the chapel of Sant'Antonio, by contrast. are characterized by cold colors, often strong, combined with light backgrounds, which together with the analytical detail give the feeling of a diaphanous light and of a detached atmosphere. It is therefore strongly recommended to all lovers of art and history, a visit to this church and its treasures! Search Church of San Pietro in Gessate in the section Photography!